1) This paper was for the first time presented as a keynote presentation at the plenary session of the FIG Working Week 2004 in Athens, Greece 24 May 2004. Key words: Geodesy, surveying, space geodesy, GNSS, education. 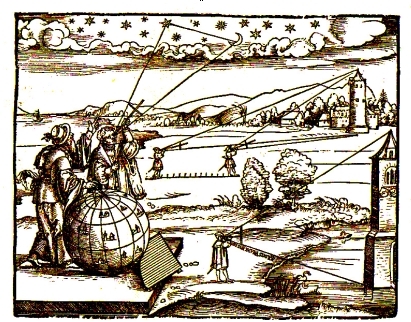 The introduction to Peter Apian’s Geographia from 1533 in Figure 1 nicely illustrates that surveying, geodesy, positioning, navigation and astronomy in the “glorious old times” in essence meant measuring angles – the scale was eventually introduced by one (or few) known distance(s) between two sites (as indicated by the symbolic measurement rod in the center of the wood-cut). Figure 1 also indicates that relative local and absolute positioning was performed with the same instruments, the so-called cross-staffs, in Apian’s days. Global positioning simply meant the determination of the observer’s geographical latitude and longitude (relative to an arbitrarily selected reference site – first several national sites, then Greenwich was used for this purpose). The latitude of a site could be established easily by determining the elevation (at the observer’s location) of the Earth’s rotation axis, approximately given by the polar star Polaris. In principle, longitude determination was simple: one merely had to determine the time difference (derived either by observing the Sun (local solar time) or the stars (sidereal time)) between the unknown site and Greenwich. The problem resided in the realization of Greenwich time at the unknown observing site in the pre-telecommunications era. One astronomical solution to this problem, also illustrated in Figure 1, consisted of measuring the so-called lunar distances (angles between bright stars and the Moon). With increasing accuracy of the (prediction of the) lunar orbit, the angular distances between the Moon and the stars could be accurately predicted and tabulated in astronomical and nautical almanacs using Greenwich local time as argument. For navigation on sea the method became obsolete with the development of marine chronometers, which were capable of transporting accurately Greenwich time in vessels over time spans of weeks. 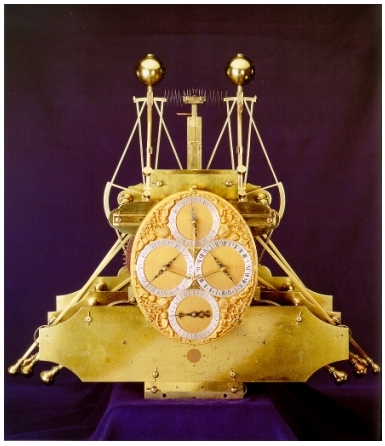 Figure 2 shows the first chronometer developed by the ingenious British watchmaker J. Harrison (1693-1776). The principles of precise positioning and navigation remained in essence the same from Apian’s times till well into the second half of the 20th century. The development of instruments and of the achieved accuracy was, however, dramatic: the cross-staff was replaced by increasingly more sophisticated optical devices, telescopes in particular. More precise star catalogues (fundamental catalogues) were produced and the art of predicting the motion of planets was refined in celestial mechanics. Eminent astronomers, mathematicians, and physicists, from L. Euler (1707-1783), P.S. de Laplace (1749-1827), to S. Newcomb (1835-1909), were steadily improving the quality of ephemerides. Highly precise pendulum clocks and marine chronometers allowed it eventually to time-tag the observations with millisecond accuracy. The relationships between pure science on the one hand and precise positioning and navigation on the other, but also between geodesy and surveying, were truly remarkable: the discipline of fundamental astronomy emerged from this interaction between theory and application. In fundamental astronomy one defines and realizes the global terrestrial and the celestial reference systems including the transformation between the systems. The terrestrial reference system was realized by the geographical coordinates of a network of astronomical observatories. An accuracy of about 100 meters was sufficient for the purpose. Until quite recently the celestial reference system was realized through fundamental catalogues of stars. The establishment of the transformation between the two systems implies the monitoring of Earth rotation in the inertial space and on the Earth’s surface. Figure 3 illustrates the motion of the Earth’s rotation axis in space. It is well known that the rotation axis approximately moves on a straight cone inclined by 23.5o w.r.t. 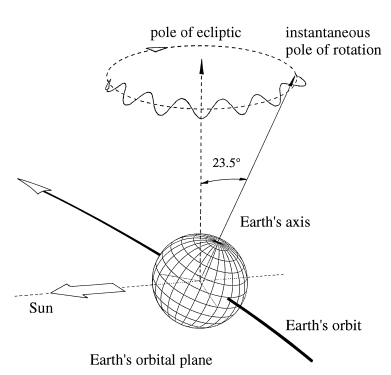 the pole of the ecliptic, an effect known as precession, which was already discovered in the Greek era (and usually attributed to the great Greek astronomer Hipparchus). This motion is not fully regular but shows short-period variations, which is why the astronomers make the distinction between precession and nutation. A study of ancient solar eclipses revealed eventually that the length of day is slowly (by about 2 ms per century) growing. The Earth axis also moves on the Earth’s surface, an effect known as polar motion. This and other discoveries related to Earth rotation made in the era of optical astronomy are summarized in Table 1.
the transformation between the two systems (i.e. the monitoring of Earth rotation). These quantities are the relevant objects of desire in fundamental astronomy and navigation. the determination of deflections of the vertical, used to correct measurements referring to the plumb-line. (The IAG European Gravimetric Geoid, EGG97, both delivers height anomalies and deflections of the vertical). In the pre-space era gravity field determination uniquely had to be based on in situ measurements on (or near) the surface of the Earth. Gravimeters, measuring the absolute value of gravity or of gravity differences, were developed. Other instruments, such as zenith cameras were developed, which allow the determination of the plumb-line (the vertical), from which deflections of the vertical may be computed. Gravimeters and zenith cameras are examples of terrestrial tools to determine the Earth’s gravity field. These in situ measurements are well suited for modeling the local or regional properties of the Earth’s gravity field. However, the global properties of the gravity field can only be modeled using a global data distribution, which today is achieved through satellite gravity missions, see section 2.1. This brief review of the methods and achievements of fundamental astronomy, navigation, surveying and geodesy reveals that all disciplines were in essence based on the same instruments in the pre-space-age era. This overview had the focus on positioning, navigation, and fundamental astronomy and therefore is far from complete. Let me mention that the entire field of photogrammetry, modeling e.g., the projection of the sky (or of a satellite image acquired by a remote sensing satellite) onto a photographic plate, is of highest interest to geodesy, as well. For more details concerning the development of navigation and positioning the reader is referred to Beutler (2003). The space age was initiated by the launch of the first artificial satellite, Sputnik I, on October 4 of the International Geophysical Year 1957. With the launch of artificial satellites it became possible to use these objects either to study the size and figure of the Earth from space or to observe them as targets from the surface of the Earth. The use of artificial satellites for geodetic purposes led to the development of satellite geodesy. The second essential development (as viewed from the point of view of geodesy) in the second half of the 20th century is that of the Very Long Baseline Interferometry (VLBI) technique as a new tool to realize an extraordinarily accurate and stable inertial (celestial) reference system. The replacement of the fundamental star catalogues by a catalogue of Quasars for the definition of the celestial reference frame (surprisingly accepted by both, the IUGG and the IAU in the 1990s) was an epochal event (which passed, however, almost unnoted by the larger scientific community). Satellite geodesy and VLBI together often are referred to as space geodetic methods or techniques. Optical period. Optical (astrometric) observations were made of the first generation of artificial Earth satellites, like Sputnik 2 and Explorer 1. The balloon satellites Echo 1 and 2 and PAGEOS (passive geodetic satellite), which could even be seen “by the naked eye”, were observed by a worldwide dedicated tracking network. These satellites were (supposedly) spherical, consisted of layers of aluminized mylar foil, and, thanks to their brightness, their tracks could easily be photographed against the star background. Even better suited, although more difficult to track, were smaller satellites like Geos 1 (Explorer 29) and Geos 2 (Explorer 36) equipped with flash lamps. Fascinating results came out of this first phase of satellite geodesy. The geodetic datums on different continents could be related to the geocenter and thus to each other with an accuracy of about 5 meters. First reliable coefficients of the gravity field (spherical harmonic expansion up to degree and order of about 12-15) were also derived. The astrometric technique, when applied to artificial satellites in the 1960s and 1970s, had serious disadvantages. The observation was day time- and weather-dependent; the star catalogues were not of sufficiently high quality and the processing time (time between observation and availability of results) was of the order of a few weeks in the best case. The optical technique therefore no longer played a significant role in space geodesy after about 1975. Remote sensing satellites, like LANDSAT and SPOT, producing images of the Earth’s surface, might also be mentioned in this category. These satellites were, however, only of marginal benefit for the determination of the Earth’s gravity field or of a highly accurate global terrestrial reference frame. Doppler period. The U.S. Navy Navigation Satellite System (NNSS), also called the TRANSIT system, had a significant impact on the development of space geodesy. It proved that a system based on the measurement of the Doppler shift of signals generated by stable oscillators on board satellites could be used for positioning with a remarkable accuracy (0.1-0.5 m relative, about 1 m absolute). The satellites transmitted information on two carrier frequencies (400 MHz and 150 MHz) near the microwave band. The two frequencies allowed for a compensation of ionospheric refraction. Rather small receivers connected to omni-directional antennas made the technique well suited to establish regional and global geodetic networks. Observation periods of a few days were required to obtain the above stated accuracy. The NNSS satellites were in polar, almost circular, orbits about 1100 km above the Earth's surface. The Doppler technique is weather-independent. The Transit system was shut down as a positioning system in December 1996 (see Kouba, 1983, for details). SLR and LLR period. SLR stands for Satellite Laser Ranging, LLR for Lunar Laser Ranging. The laser technique, developed in the 1950s, may be used to generate high energetic short light pulses. These pulses are sent out by a conventional astronomical telescope, travel to the satellite (or Moon), are reflected by special corner cubes on the satellite (or Moon) back to the telescope. The travel time of the laser pulse from the telescope to the satellite (or Moon) and back to the telescope is measured and corresponds (after multiplication with the speed of light) to twice the distance between satellite and telescope at the time the light pulse is reflected by the satellite. Today's SLR technique is capable of determining the distance between observatories and satellites with an accuracy of few millimeters and with a high repetition rate (up to a few Hz). SLR techniques may be used for every satellite equipped with corner cubes. The unique and most valuable contributions of SLR lie in the determination of the Earth's (variable) gravity field, in the determination of the geocenter, and in calibrating geodetic microwave techniques. LLR measures distances between an observatory and the reflectors deployed on the Moon by the Apollo space missions and the Russian Lunokhod missions. The technique is, e.g., capable of measuring directly the secular increase of the Earth-Moon distance (3.8 cm per year). Also, LLR is well suited for evaluating gravitational theories. VLBI period. 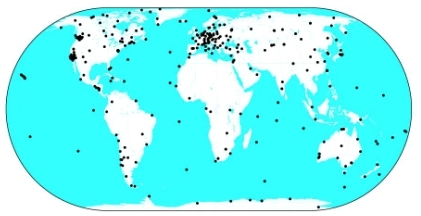 Very Long Baseline Interferometry (VLBI) is the only non-satellite geodetic technique contributing to the International Earth Rotation Service (IERS). Its unique and fundamental contribution to geodesy and astronomy is the realization of the celestial reference system and the maintenance of the long-term stability of the transformation between the celestial and terrestrial reference frames. The ICRS (International Celestial Reference System) is defined and maintained by the (recently renamed) International Earth Rotation and Reference Systems Service (IERS). It was adopted by the IAU and the IUGG as the primary celestial reference system, replacing its optical predecessors based on fundamental star catalogues. The observation and analysis aspects are today coordinated by the IVS, the International VLBI Service for Astrometry and Geodesy. Altimetry missions. Altimetry missions, based on the radar technique, significantly improved our knowledge of the sea surface topography, of ocean currents, of tidal motions of the oceans, etc. There is a long list of altimetry missions including, e.g., GEOS-3, SEASAT, ERS-1 and -2, Envisat, etc. The TOPEX/Poseidon (TOPography EXperiment for ocean circulation) mission was the first mission which was specially designed to study the ocean currents. For space geodesy the TOPEX/Poseidon mission was a kind of rosetta stone mission, because its orbit was determined using three independent systems (the French DORIS system, SLR tracking, and the GPS). TOPEX/Poseidon was neither the first, nor will it be the last altimetry mission (actually, its successor Jason is already in orbit). Missions like CRYOSAT (a three-year ESA radar altimetry mission to determine variations in the thickness of the Earth’s continental ice sheets) and ICESAT (NASA’s mission for measuring the ice sheet mass balance, cloud, and aerosol heights, etc.) will significantly improve our knowledge of the Earth’s ice sheets. SAR and InSAR missions. Satellite missions based on the Synthetic Aperture Radar technique and interferometric SAR (InSAR) have the proven potential to revolutionize deformation monitoring and measurements. As opposed to the conventional positioning techniques, SAR and InSAR give deformation information for extended areas (up to a few hundred km). In this sense the SAR techniques and photogrammetry are closely related. Gravity space missions. For geodesy and geodynamics the CHAMP (Challenging Mini-Satellite Payload for Geophysical Research and Application) mission, the GRACE (Gravity Recovery and Climate Experiment) mission, and the upcoming European GOCE (Gravity field and Ocean Current Explorer) mission are particularly fascinating. It is expected that our knowledge of the Earth’s gravity field (thanks to the use of spaceborne GPS receivers, accelerometers, and gradiometers) will significantly grow thanks to these missions. Gravity missions are of central importance for altimetry, because the precise geoids are required to refer the sea surface topography to the geoid. GNSS period. GNSS stands for Global Navigation Satellite System. The current generation of GNSS may be viewed as the successor of the Doppler systems. The systems are based on coherent microwave signals (in the L-band) emitted by the satellites in (at least) two carrier frequencies. Simultaneity of measurement of the signals emitted by several satellites and recorded by a receiver allow for instantaneous positioning. The GPS (Global Positioning System) is probably the best known GNSS and, on top of that, the best known space geodetic technique today. The system has an impact on science and society as a whole, reaching far beyond space geodesy. GPS revolutionized surveying, timing, pedestrian, car, marine and aircraft navigation. Many millions of receivers are in use today. Spaceborne applications of the GPS have a deep impact on geodesy and atmospheric sciences. Other systems, like the Russion GLONASS and the planned European Galileo system (if/when fully deployed) will have a similar impact in future. The impact of the GPS on geodesy and on IAG was so significant, that this aspect will be dealt with separately in section 2.3. The overview in this section was based on an article on space geodesy prepared by the author for the Encyclopedia of Astronomy (Murdin, 2001). In geodesy, as in other branches of science, one has to distinguish between the scientific questions asked and the tools used to answer these questions. Many questions asked today in geodesy are still the same as, or closely related to, those asked in the 19th century (at least if the questions are framed at a high enough level). The technical developments related to the space age, the development of powerful computers (note that in fundamental astronomy computers were human beings (! )), and the development of smmunication allow it to tackle many more questions of, and to find much more detailed answers to, classical problems. One aspect, however, will never change in geodesy: Geodetic problems only can be successfully addressed through international collaboration. The discussion of the development of the IERS will underscore this statement. The Bureau Gravimetrique International (BGI), systematically collecting and archiving gravity(-related) information in a worldwide basis is another excellent example of international collaboration in geodesy. It is a noble duty of an international association to focus the interests of its community on the relevant scientific questions using the state-of-the-art techniques available to it. The IAG has attempted to cope with this challenge ever since its creation in 1864. This is true in particular in the space age – no trivial problem in view of the dramatic evolution of the geodetic tools in the second half of the 20th century. For more information concerning the history of the IAG the reader is referred to Beutler et al. (2004a, 2004b). Let us have a closer look at Earth rotation in this section. The example nicely demonstrates how the IAG works. There are quite a few topics in geodesy which only can be explored successfully, if a particular effect is regularly monitored. Sea level motions (on all time scales) and Earth rotation are two excellent examples. In such cases IAG tends to hand over the “routine work” to a scientific service in order to ensure the long-term availability of the raw measurements and the derived products. An IAG service is created, if measurements and products are well defined, regularly generated, and of importance for a large user community. The IERS, e.g., is the IAG service dealing with all aspects of Earth rotation, the definition and maintenance of the global terrestrial and the celestial reference frames, and with monitoring the transformation between the two reference systems. The IERS is a multi-technique service. The roots of the IERS go back to the year 1899 when the ILS, the International Latitude Service, was founded by the (predecessor of) the IAG. Polar motion was derived from latitude observations performed at (initially) six observatories (Mizusawa (Japan), Tschardjui (former USSR), Cagliari (Italy), Gaithersburg (USA), Cincinnati (USA), Ukiah (USA)). The Central Bureau of the ILS was initially located at the Geodetic Institute of Potsdam (Director F. R. Helmert, responsible C.T. Albrecht), then moved to Japan (Mizusawa) in 1922 with H. Kimura as director, then to Italy in 1935, to go back to Japan in 1962 with S. Yumi as director. distribute the data required, and publish the initial data and obtained results. This mandate is close to the mandate of the IERS. It is interesting to note, however, that the celestial and terrestrial reference frames, implicitly needed for the work of the IPMS, were not explicitly mentioned in the above list, because the celestial frame could be taken from astronomy (fundamental catalogues) and the terrestrial frame from geodesy with sufficient accuracy. define the standards, constants, models, etc., required for Earth rotation work. 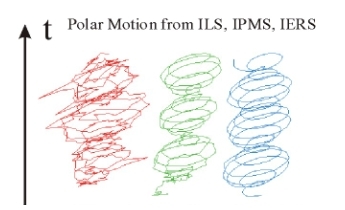 Figure 4 gives an impression of the achievements of the three IAG services monitoring polar motion (the “only” product of the ILS, one of the products of the IPMS and the IERS). Obviously the advances were dramatic, at least in terms of accuracy. It is, however, important to point out that in all cases one and the same aspect was studied with the state-of-the-art tools of their respective eras. According to Mueller (1993) the primary motivation in planning the IGS was the recognition in 1989 that the most demanding users of the GPS satellites, the geophysical community, were purchasing receivers in exceedingly large numbers and using them as more or less black boxes, using software packages which they did not completely understand, mainly for relative positioning. The other motivation was the generation of precise ephemerides for the satellites together with by-products such as Earth orientation parameters and GPS clock information. These ideas were discussed in 1989 at the IAG General Meeting in Edinburgh and led soon thereafter to the establishment of a Working Group, later re-designated as the IAG Planning Committee for the IGS, with Ivan I. Mueller as chairman. The Call for Participation was issued on February 1, 1991. More than 100 scientific organizations and governmental survey institutions announced their participation. At the 20th General Assembly of the IUGG in Vienna in 1991 the IAG Planning Committee was restructured and renamed the IGS Campaign Oversight Committee. The author was asked to chair the committee and accepted the honour. The committee started organizing the 1992 IGS Test Campaign and Epoch'92. The essential events of this first phase of the IGS development are summarized in Table 2. The 1992 IGS Test Campaign, scheduled to last from 21 June to 23 September 1992, focused on the routine determination of high accuracy orbits and Earth Rotation Parameters (ERPs). It was to serve as the proof of concept for the future IGS. Epoch'92 was scheduled as a two-week campaign in the middle of the IGS Campaign for the purpose of serving as a first extension of the relatively sparse IGS Core Network analyzed on a daily basis by the IGS Analysis Centers. Two weeks after the start of the IGS Test Campaign on June 21, 1992 the first results of the IGS Analysis Centers started to flow into the IGS Global Data Centers, which in turn made these results available to the user community. The ERP series were regularly analyzed by the IERS Central Bureau and by the IERS Rapid Service Sub-bureau. Toward the scheduled end of the IGS Test Campaign it became apparent that the campaign was an unqualified success and that it would be most harmful to stop or interrupt the data collection and analysis activities. Therefore, data collection and transmission, as well as data analysis, continued on a best effort basis after the official end of the 1992 IGS Test Campaign on 23 September, 1992. As a consequence, the Oversight Committee decided to formally establish the IGS Pilot Service to bridge the gap between the 1992 IGS Test Campaign and the start of an official service. At the 1993 IGS Workshop in Bern, devoted to the evaluation of the 1992 IGS Test Campaign and of Epoch’92, “everybody” was confident that the IGS community was ready to support the start of an official service in the near future. the orbit, ERP, and satellite clock comparison, and the combination strategies according to Beutler et al. (1995) proved to be reliable and robust. It is was felt that it was absolutely essential that the user community be able to access reliable, robust and unique IGS products of the highest quality within the promised time limits in addition to the products of the individual Analysis Centers. The consistency of the IGS “combined” products is difficult to establish, because they are based (at least partly) on the same observations used by the Analysis Centers. They are used to estimate a common subset of parameters in addition to center-specific parameters. The IGS network is undoubtedly the densest space geodesy network of tracking stations, and therefore makes a very strong contribution to the ITRF. Similar statements can be made about the IGS ERPs: with their sub-milliarcsecond accuracy and their (at least) daily resolution of polar motion, the IGS significantly contributes to the monitoring of the ERPs. What was said so far about the development of the IGS since 1993 could be characterized by the olympic logo “altius, citius, fortius”. The IGS development had, however, yet another component: the IGS developed into a multi-disciplinary service by extracting the maximum information from the permanent IGS tracking activities. Today, the IGS should therefore be called an Interdisciplinary Service in support of Earth Sciences, see Beutler et al. (1999). The IGS workshops, taking place at a frequency of 1-2 per year, were extremely important in this context. 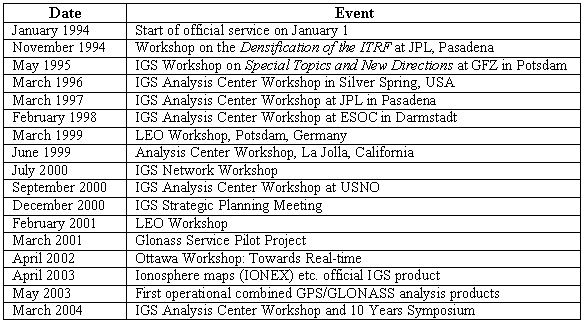 They are listed, together with other important IGS events, in Table 4.
development in the direction of a GNSS service. 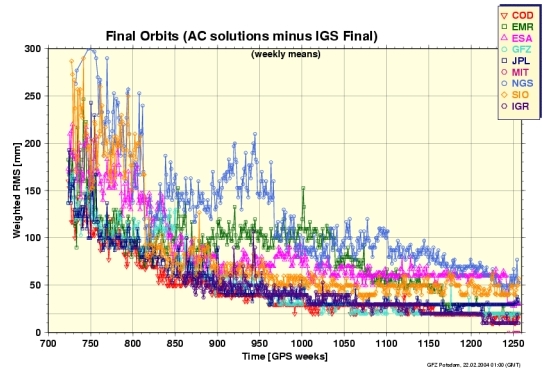 Let us illustrate the interdisciplinarity of the IGS with an example stemming from Fall 2003, when there was exceptionally high solar activity. This high level of solar activity induced in turn a very high level of ionization in the Earth’s ionosphere, which was recorded by the IGS network. 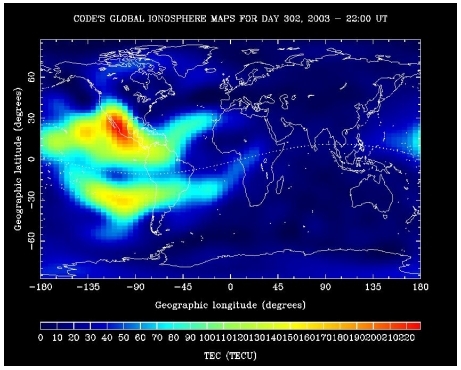 At the CODE (Center for Orbit Determination in Europe) homepage (URL http://www.aiub.unibe.ch/igs.html) one may find a “movie” of the maps of the exceptionally high ionospheric activity in the same timeframe. Figure 7 shows the maximum Total Electron Content observed in October 2003. The IGS, together with the IERS, pioneered the development of modern services in the IAG, probably even in the whole of Earth sciences. Their example was followed by the IVS (International VLBI Service for Geodesy and Astrometry) and the ILRS (International Laser Ranging Service). These space geodetic services, together with the IAG services related, e.g., to the determination of the Earth’s gravity field, are of fundamental importance in modern geodesy, and in the wider field of Earth sciences. They are part of a very precious global geodetic infrastructure. The development of space geodesy has had a significant impact on the new structure of the IAG in the 1999-2003 time frame. In the new structure, the four new IAG Commissions, established in 2003, and the IAG Services are elements on the “same level” (Beutler et al., 2004s, 2004b). Three service representatives are members of the IAG Executive Committee in order to facilitate the creation of the proper interfaces between the IAG Commissions and Services. The IGS, together with all other space geodetic services, are part of our global geodetic infrastructure. The network of gravity sites, space geodetic missions (such as Lageos, CHAMP, GRACE, GOCE), and the network of geodetic analysis centers are part of this global infrastructure as well. However, this global infrastructure is not secure in times of reduced funding for science in general. These considerations were the motivation to create the IGGOS project in the new IAG structure. IGGOS stands for Integrated Global Geodetic Observing System. System should be understood as the basis on which the future advances in geosciences can be built. By considering the Earth system as a whole (solid Earth, atmosphere, ocean, hydrosphere, ice, liquid core, etc. ), monitoring it by geodetic techniques and by studying it from the geodetic point of view, the geodetic community does provide the global geosciences community with a powerful tool, consisting essentially of high quality services, standards and references, and theoretical and observational innovations. IGGOS is based on the existing IAG Services. IGGOS seeks to provide a framework for existing, or future, services and to ensure their long-term stability. New entities will be established only if there is a stringent requirement to do so. IGGOS shall be recognized by partners outside the IAG, e.g., by UNESCO, ICSU (International Council of Science), IGOS (the United Nations' Integrated Global Observing Strategy), governments, inter-government organizations, WCRP (World Climate Research Program), IGBP (International Geosphere Biosphere Program), etc., as geodesy's most important contribution to the Earth sciences. an IGGOS Science Council representing the geodetic community. in one and the same consistent reference system. The consistency of the geometrical and gravitational IGGOS products at the 1 ppb or better level are of central importance. Prof. Christopher Reigber of the GeoForschungsZentrum (GFZ), Potsdam, is chairing the IGGOS in its definition phase 2003-2005. "The International Association of Geodesy (IAG) and the International Federation of Surveyors (Fédération Internationale des Géomètres FIG) both recognize that each is an international organization with many complementary activities serving similar professional constituencies involving research and development into varied aspects relating to surveying, engineering surveying and surveying techniques. FIG specializes in technical and professional areas such as positioning and measurement, engineering surveys, hydrography, geographic information systems, infrastructure development, land and environmental planning, development and management, property valuation, and construction economics and procurement. IAG specializes in scientific and professional areas such as positioning, advanced space technology, determination of the gravity field, general theory and methodology and geodynamics. IAG furthermore coordinates the work of a number of international services such as the International GPS Service. The purpose of this memorandum of understanding is to provide an effective framework for a continuing liaison between the two organizations, for maintaining and increasing the opportunities of technical exchange between their members through a continuing programme of co-operation leading to mutual sharing of knowledge and expertise to the advantage of the membership of both organizations." According to this memorandum common activities include regular contacts between the secretaries and presidents, information concerning the organizations’ structure, encourage representation of the other organization in the appropriate entities, participation in the other association’s meetings. Themes of common interest include reference frames and observing systems, positioning, measurements and applications, hydrographic surveying and marine geodesy, geoid determination and height systems, applications to engineering, education, history, and cooperation with other international organizations (UN, etc.). The memorandum further suggests that each organization should inform the other about its schools, seminars, etc., and consider the possibility to organize common events of this kind. Matt Higgins, chair of FIG Commission 5, with the help of Chris Rizos, president of IAG Commission 4, further investigated possible common activities considering the new structure of IAG (Higgins, 2003). The report states in particular that the IAG Commission 4 “Positioning and Applications” and FIG Commission 5 have strong common interests. In addition, the report states that the IAG Service IGS is of great interest to FIG, in particular to its Commission 5. It is also proposed that IAG should be more closely involved in FIG regional events. 3.2 What was Achieved so far? A regular information exchange at the highest level between the two associations is taking place (the most recent one in September 2003 in Copenhagen). The associations obviously (!) have the opportunity to become involved in the each other’s major meetings. A close cooperation between FIG Commission 5 and IAG Commission 4 are planned, e.g., in the context of the FIG regional conference in Jakarta. There are examples of IAG representatives in FIG entities, and vice versa. All in all the contacts are good, but (perhaps) not yet too exciting. In view of the commonalities of the two organizations, further development and a strengthening of the IAG-FIG relationships would make sense. The establishment and evolution of good relationships depends to a great extent on the individuals involved in the process. There can be no doubt that the current leadership of the IAG and the FIG wish to further improve relations between their respective organizations, and to that end common projects are strongly encouraged. Such coordination is made easier by the facts that the headquarters of the two organizations currently are located in the same city (Copenhagen) that the leaders of the two (most) relevant commissions (in this context) in the FIG and IAG live and work on the same continent (and the same country Australia). Maintain the level of information and consultation at the topmost level, as stated in the FIG-IAG memorandum. The contacts between FIG Commission 5 and IAG Commission 4 might be put on a more formal basis (e.g., by having mutual representation in the respective executive boards). Make the best possible use of the global geodetic infrastructure. Identify entities in IAG and FIG, where a cross representation seems beneficial. Identify a few areas of research and application, where a common unit might make sense (the IAG Commission ICP 1.2 on Vertical Reference Frames might, e.g., be generalized in an appropriate way; There seems to be room enough for both, science and application, in this area – something that should be explored). Identify (well ahead of time) workshops, symposia, etc., where common session, etc. could be organized. Consider the establishment of common schools (might be based on IGS tutorials). Define areas where FIG and IAG might have a common representation w.r.t. organizations like the UN (e.g., United Nations activities related to the use and applications of Global Navigation Satellite Systems). The ideas developed here clearly are in the spirit of the MoU between FIG and IAG. They also may be understood as a first reply to the ideas outlined by Higgins (2003). At this point in time they should be viewed as discussion items. Beutler, G., J. Kouba, T. Springer (1995). Combining the Orbits of IGS Processing Centers, Bulletin Géodésique, Vol. 69, No. 4, 200—222. Beutler, G. (1996). The International GPS Service for Geodynamics: The Story. Proc, IAG Symposia No 115, pp. 3-13, Springer Verlag. Where is Beutler et al 1999? Beutler, G., M. Rothacher, S. Schaer, T. A. Springer, J. Kouba, R. E. Neilan (1999). The International GPS Service (IGS): An Interdisciplinary Service in Support of Earth Sciences. Advances of Space Research, Vol. 23, 631—653. Beutler, G. (2003). Satellite Navigation Systems for Earth and Space Sciences. Spatium, 10 (June 2003), International Space Science Institute (ISSI), Bern. Beutler, G., H. Drewes, A. Verdun (2004a). The Integrated Global Geodetic Observing System (IGGOS) Viewed From the Perspective of History, Proceedings of IAG Symposium “IGGOS”, IAG General Assembly, Sapporo, Japan. In press. Beutler, G., H. Drewes, A. Verdun (2004b). The New Structure of the International Association of Geodesy (IAG) Viewed From the Perspective of History, Journal of Geodesy. In press. Higgins, M. (2003). The new Structure of IAG and its Relevance to the FIG, FIG internal document. Kouba, J. (1983). A Review of Geodetic and Geodynamic Satellite Doppler Positioning, Rev. Geophys. Space Phys., Vol 21, 27-40. Murdin, P. (ed.) (2001). Encyclopedia of Astronomy and Astrophysics, Institute of Physics Publ., Bristol, Philadelphia. Mueller, I.I. (1993). Planning an International Service using the Global Positioning System (GPS) for Geodynamic Applications, Proc.IAG Symp. No.109 on Permanent Satellite Tracking Networks for Geodesy and Geodynamics, Springer Verlag. Gerhard Beutler was born in 1946 in Berne (Switzerland). Studies of Astronomy, Physics and Mathematics at the University of Berne 1964-1971 were completed with the Diploma in Astronomy 1971 and the Ph.D. in 1976; the habilitation (2nd doctorate) followed in 1983. His work at the University of New Brunswick in Canada in 1983-84 was essential for the development of the Bernese GPS-Software System between 1984 and 1991. In 1991 Gerhard Beutler was elected as Professor of Astronomy and Director of the Astronomical Institute of the University of Bern. The main research areas are Fundamental Astronomy, Celestial Mechanics, and satellite-based positioning und navigation methods. Between 1991 and 1998 Gerhard Beutler served as Chairman of the IGS Oversight Committee (IGS=International GPS Service), then as the Chairman of the first IGS Governing Board. From 1995 to 1999 he was president of the CSTG (the time period when the IVS and the ILRS were created), then he was elected as First Vice-President of IAG in 1999. He is also a member of ESA‘s Earth Science Advisory Committee (ESAC) since 1999, and he was granted the IAG Fellowship in 1995, that of AGU (American Geophysical Union) in 1998.